So I just sit here at the computer, playing games and writing things to put in the blog. Since today is Wednesday, I did go by Mango for Games Day. I brought my cell phone because Globe is supposed to call before coming by. Sometimes they do not, but mostly they do. 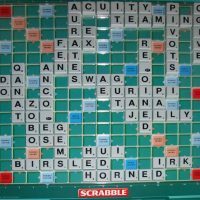 They didn’t call, but I did play 3 games of Scrabble. I came in 3rd, 2nd and then 1st. I guess I just needed to warm up a little bit. Here, at the house, I have mostly been playing one of my hidden object games. The one called Youda Legend – The Curse of the Amsterdam Diamond. It’s one of the few games I have purchased from Big Fish. I’ve had this one for years. My best game is 322,150 points. Later, since I seriously doubt Globe will be showing up today, I guess I’ll watch a movie or two that I have stored on my computer. I should have them on an external hard drive, but I have yet to purchase one. I plan to get a 2TB drive to store the movies on and get them all off of my internal hard drive. So now it’s 24 Nov. The internet WAS up for almost the whole day. Some of y’all may not believe this, but when I woke up from my nap, the internet was down again. I’m not even going to bother with them anymore today. It’s late now and tomorrow we have a brownout from 7 am to 5 pm, so tomorrow is out also. They are fixing something again. It seems they are always fixing something with our electric company. I did go ahead and call Globe later though. I let them know that I was down … again and that we are having the brownout tomorrow. I wanted to get my work order in as soon as possible. They have not exactly been on top of their game lately. During the all-day brownout, that actually went out @ 0745, I did get to play my favorite board game, Empire Builder. I won, but only by 1 move. The nephew that won last time starting telling me that he would win next move. I didn’t bother to tell him, until after I moved, that I would win right in front of him. He was a little shook, but he’ll be back playing and probably winning a few soon. Our power came back on a little early, @ 4:20 pm. By 4:22 pm I was on the phone to Globe. Supposedly they were expediting my issue and would actually show up today. I’ll just have to wait and see. I have NFL action to watch in the morning and I’d like to be able to do that. I waited until 6 pm. They never showed or even called back. It’s dark outside now, so I won’t see them today. I’ll just have to call again in the morning. Again I say, it must be nice to be the only real internet service around here. They get away with so much because of it. If another real option ever comes up, I’m sure that lots of people will be switching.